Do you wish you could eliminate repetitive in-game tasks, or do you need a little help to take your gameplay from average to awesome? If you do then Chimpeon is the perfect gaming partner that automates actions in almost any Windows® game. Anything that can be performed using a mouse click or keystroke can be automated by Chimpeon with ease. Whether you want to perform a combat rotation in an MMORPG, auto aim in an FPS or constantly smash a button in a clicker game, Chimpeon has the tools to make it happen. Simply configure the conditions that must be satisfied before a key or mouse button is pressed then hit Chimpeon's Start button to begin automation. Download and try Chimpeon now and join the thousands of users who have discovered that automating a game has never been simpler! Chimpeon is easy to use and enables the automation of in-game actions in minutes without the need to write scripts or use additional third-party software. 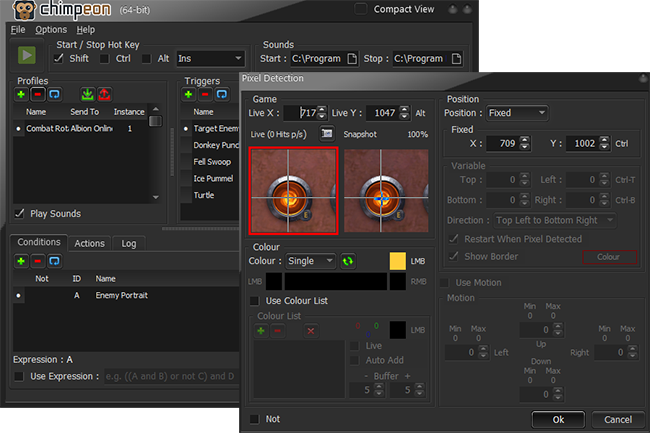 Chimpeon presses keys or mouse buttons when a time interval expires or when a pixel colour is detected (or not) at a static or varied location. Chimpeon works alongside many Windows® games including MMORPG, RPG, FPS, browser, Store, and Android (emulated). Chimpeon is used by thousands of gamers across the globe so you can be certain it is one of the best game automation solutions available. Chimpeon works independently from your game making it one of the safest ways to automate gameplay. It can even be used remotely for when remaining undetected is paramount! Avoid paying extortionate fees to automate your gameplay by using our no strings monthly payment plan that costs less than $0.14 per day.